This publication, the fourth in MFRI’s “Risk and Resilience in Military Families” series, was a result of a 2015 convening of high-level experts and thought leaders in the fields of government, higher education, corporate, philanthropy, behavioral health, higher education and research on military families. The event aimed to leverage the synergy from the 2015 gathering and build on the 2018 book release. “These important groups are coming together to actively engage and collaborate to find solutions for military and veteran families,” said Shelley MacDermid Wadsworth, MFRI director. The highlight of the day was the presentation of the 2017 and 2018 MFRI Excellence in Research on Military and Veteran Families Award. 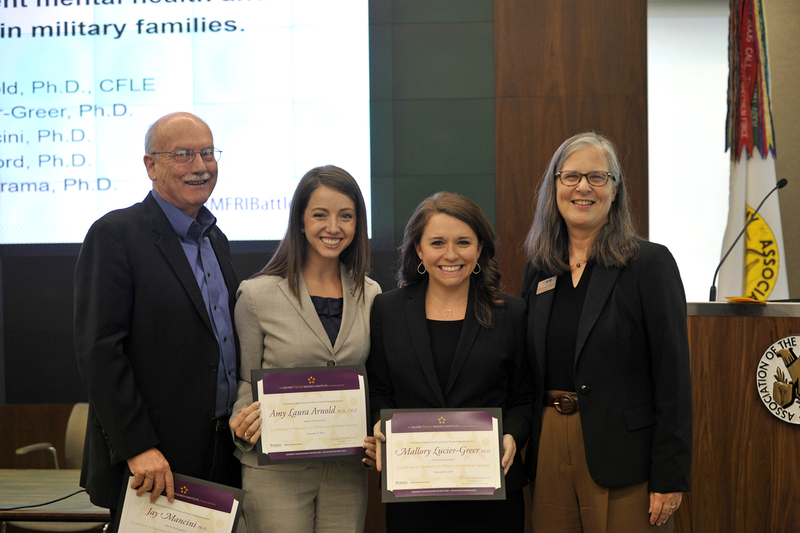 According to MFRI, the award aims to bring visibility of military and veteran families by increasing the impact of rigorous scientific evidence on programs, policies, and practices, strengthening connections between researchers and practitioners and raising awareness about military and veteran families across many disciplines. Research analysis indicate family forms (specifically being a part of a stepfamily or single-parent family) were associated with increased depressive symptoms and decreased academic performance. However, when accounting for family support, parent-adolescent connection, and personal initiative, no differences were found across family structures. Military youth can thrive in the presence of healthy family processes. The Military Family Research Institute (MFRI) at Purdue University conducts research on issues that affect military and veteran families and works to shape policies, programs, and practices that improve their wellbeing.